Galactic Cosmic Rays (GCRs) and Solar Energetic Particles (SEPs) present formidable radiation hazards (e.g., Cucinotta et al., 2010) for human and robotic operations beyond Low Earth Orbit (LEO). As new plans are conceived for human exploration beyond LEO, these space radiation hazards create critical needs for accurate situational awareness. A new near-real-time tool called PREDICCS (http://prediccs.sr.unh.edu, Predictions of Radiation from REleASE, EMMREM, and Data Incorporating the CRaTER, COSTEP, and other SEP measurements) provides the first online system for predicting and forecasting the radiation environment in near-Earth, lunar, and Martian space environments. PREDICCS integrates a host of near-real-time measurements being made by satellites currently in space with numerical models (e.g., EMMREM; Schwadron et al., 2010) to determine radiation doses and dose equivalents that characterize biological impacts, and energetic particle propagation codes that can accurately project radiation levels through the inner solar system and out to Mars. PREDICCS provides updates of the radiation environment on an hourly basis and archives the data weekly, monthly, and yearly to provide a clear historical record of the space radiation environment. Figure 1. A direct comparison between the results of PREDICCS at the Moon (red and green) and at Mars (purple) with measurements of CRaTER (blue) strongly validates PREDICCS. 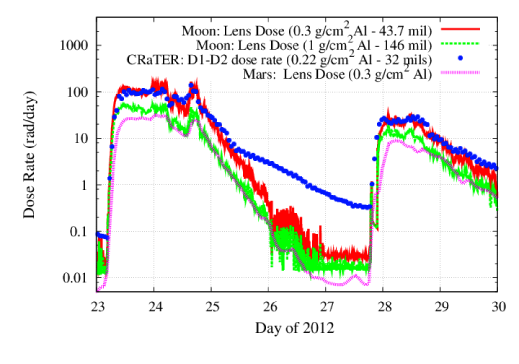 Shown here are PREDICCS proxies for the lens dose rate at the moon behind 0.3 g/cm2 Al shielding (red), behind 1 g/cm2 Al shielding (green), the CRaTER measurement for the lens dose rate (blue) behind 0.22 g/cm2 Al shielding and the PREDICCS lens dose rate proxy at Mars behind 0.3 g/cm2 Al (purple dotted line). PREDICCS is supported by the NSF/FESD Sun-to-Ice Project (Grant AGS 1135432), NASA/LWS/NSF EMMREM Project (Grant NNX07AC14G), NASA LRO/CRaTER/PREDICCS Project (Contract Number NNG11PA03C). The model takes simulated events and time series, observed events and time-series, or user-specified input for the energy and angular distributions of particles incident from interplanetary space. Users specify: (1) LEO, Moon, and Mars scenarios including altitudes and (2) shielding depths. In the future, users will have the option of specifying spacecraft, habitat, spacesuit, human CAF/CAM models, and surface (albedo) effects. EMMREM outputs currently include time-dependent dose-related quantities (accumulated dose and dose-equivalent rates). Linear Energy Transfer (LET) spectra will soon be available. Events, time-series, and case-studies for validation are also collected into the online data-base. Cucinotta, F. A., S. Hu, N. A. Schwadron, K. Kozarev, L. W. Townsend, and M.-H. Y. Kim, Space Radiation Risk Limits and Earth-Moon-Mars Environmental Models, Space Weather, 8, doi:10.1029/2010SW000572, 2010. Schwadron, N., A., L. Townsend, K. Kozarev, M. A. Dayeh, F. Cucinotta, M. Desai, M. Golightly, D. Hassler, R. Hatcher, M. Y. Kim, A. Posner, M. PourArsalan, H. Spence, R. K. Squier: The Earth Moon Mars Radiation Environment Module Framework, Space Weather Journal, 8, doi:10.1029/2009SW000523, 2010. Spence, H. E., et al., Cosmic Ray Telescope for the Effects of Radiation on the LRO Mission, Space Sci. Rev., 150(1-4), 243-284, 2010.